Fasano shows the results of her annual "cake test," based on The Hours, with her American Literature class. Fasano and former classmate Dorothy Robinson at the DPH Reunion last year. 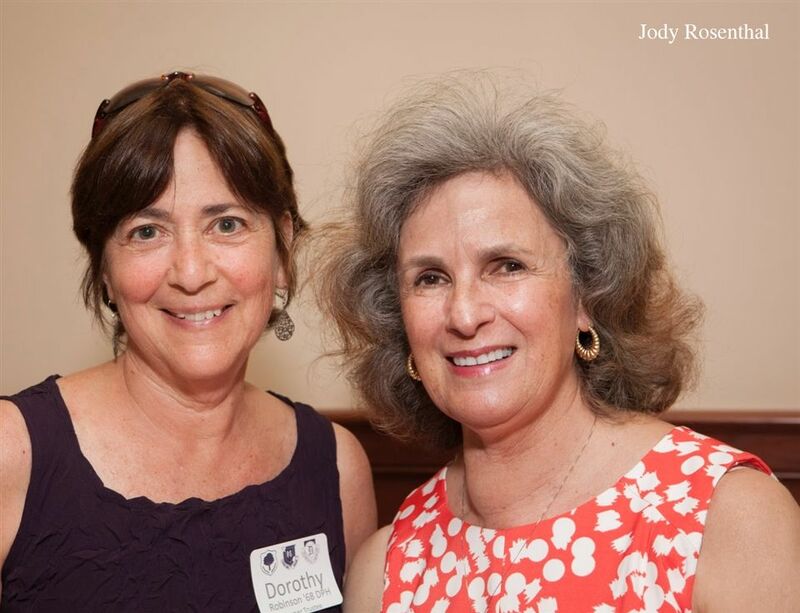 When Donna Fasano retires from Hopkins this June, she will end an era that has spanned her forty-two years teaching English at Hopkins. While many students know Fasano from her friendly presence, her care for her students, and her writing assignments that turn mere children into scholars, she has also witnessed and played a part in nearly the entire development of the coeducational Hopkins School, from its frst years as a merged school to its present state. She is the last faculty member remaining who was a part of Day Prospect Hill (DPH). in math; Betty Benedict, her math teacher at DPH, had been her idol and was her mentor in later years. Fasano’s said that her favorite part of Hopkins has been teaching the seventh grade. “All these kids are new, and I get to bring them into the Hopkins standards and life." She popularized Oliver Twist’s “Please sir, may I have some more,” and had students memorize a long list of prepositions that they had to recite in record time to receive unlimited access to her drawer of lollipops. These projects were paired with writing assignments, typically a short essay every night. Students noted that access to Fasano’s candy drawer served as both a reward for enduring her class and an opportunity to reconnect with her on a regular basis. “I am thankful for the small conversations I have with Ms. Fasano while I got my access,” wrote Lauren Sklarz ’22. “I have never felt so at home in a classroom, so at peace, so content. We came into her class as students; we leave as writers,” said Katrina Tiktinsky ‘18, currently in her Current American Fiction class. Several of Fasano’s colleagues praised her presence and ideals inside and outside the classroom: Art Department teacher Peter Ziou said, “What she loves is sharing her knowledge of writing and books and having the students fnd a creative power. She expects the best out of them.” “By her abiding gift for reading and writing, Donna sustained my enthusiasm; by her abiding concern for her students, she reminded me to care for what matters,” said Chris Jacox, a fellow English teacher. “When I taught in her old classroom, I would bump my head on all the memorabilia dangling from the ceiling. But you have to respect the care,” said Ian Melchinger ’88, Fasano’s colleague in the English Department and former student of hers.